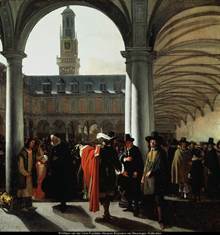 In the 1600s, the world’s first stock exchange was established in Amsterdam. In 1688, a trader by the name of Josef de la Vega wrote “Confusion Of Confusions” – the world’s oldest surviving account of trading stocks. The book is an amazing record of the business. Yet despite being written over 300 years ago, it sounds eerily familiar to our markets today. 3) “Profits on the exchange are the treasures of goblins. At one time they may be carbuncle stones [gemstones], then coals, then diamonds, then flint-stones, then morning dew, then tears”. I guess he means investment gains are not permanent. So, looks like nothing much has changed! Interesting post and quite timely as I have been asked to guest post on a financial blog and will talk about the psychology of an investor. I will certainly read this book as well. It reminds of the “The Coffee Trader” also taking place in Amsterdam’s early markets. Another great read. Thanks for book recommendation. Will take a read of that too!